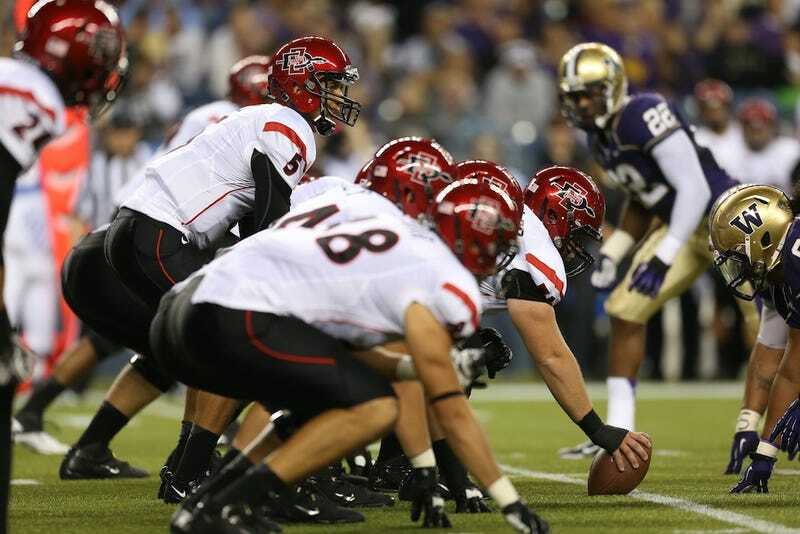 How's That "Going For It On Fourth Down" Thing Going For San Diego State? This August brought momentous news: San Diego State Aztecs head coach Rocky Long had done lost his mind, and would be implementing essentially the strategy all advanced football stats people have been stridently advocating since the dawn of advanced football stats. Long was going for it on fourth (inside the other team's 50). We loved it. Chris Kluwe hated it. Families were torn asunder and engagements broken. But how's it actually going? Among all teams playing FBS football, San Diego State is tied for the 39th in fourth down conversion attempts, with eight. They're tied for 42nd in successful fourth down conversion attempts with 4. Through five games (the Aztecs are 2-3 overall, 0-1 in the Mountain West), Rocky Long's newfangled strategy has compiled conversions and attempts statistics that are both around the top third of FBS teams, but aren't eye-popping, and in fact, aren't much to suggest that Long really stuck to his promise. Lane Kiffin's been far more adventurous, as has Bill O'Brien at Penn State, and John L. Smith at Arkansas (the Razorbacks are 2/10 on fourth down, right in line with everything else we know about the Razorbacks). Maybe Long chickened out a bit, or maybe he realized he didn't have the personnel. Maybe SDSU just hasn't been in the right situations. Whatever the case, the Aztecs' starting kicker has 27 points to his name this year, and the punter has gone out on the field six times. We wrote in August that Long only needed worry about reprisal from media and fans should one of his risky—well, not quite risky, but novel and therefore scary—conversion attempts fail. A lot of people thought even that was silly: Seeing as how the Aztecs are a mediocre team about to flee their conference, no one could get very riled up about the four failed conversions, right? It's Tuesday of a new game week, yet Long was still fielding questions about the decisions he made against the Huskies in Seattle last Saturday. The coach took the opportunity to correct the spreading notion that the Aztecs have married themselves to the "go-for-it" chart because they have crappy kickers. "I think our kickers are competing well. I don't think they've shown real consistency in practice, but I think I gave the wrong impression," Long said. "That's not why we didn't kick field goals or extra points. "We didn't kick field goals or extra points because that wasn't the game plan going in. We've done some elaborate statistical analysis on how to score the most points, and that's exactly how we played the game." But it didn't work, one reporter pointed out. There you go football coaches: say you're going to try something new and you don't even really have to try it to get crap for it. We hope Rocky Long starts kneeling on the first three downs and throwing hail maries on fourth, just to piss people off.